What can Honeysuckle colored jewelry or accessories do for me? Honeysuckle is a bold reddish pink that will give you a rosy glow when worn. Even a little bit of honeysuckle in your accessories can be eye-popping-ly attractive especially since summer’s here. Honeysuckle will go with every skin tone and can be worn as a day-time accessory or a night-time one. If you need a quick mood lift, slip on some honeysuckle colored earrings or a lovely ring and your ready to take on the world! As Pantone’s website suggests, you can wear these pieces of jewelry with black, navy, or gray clothes. Personally, I would prefer to tone down the contrast and wear them with a charcoal or light gray outfit in winter or for a formal occasion. For casual style, you could wear these gorgeous pieces with a pale buttercup yellow summery cotton blouse/dress or with a crisp white tee and dark jeans. Complementary bronze greens like Willow PANTONE 16-0632 and/or Tapenade PANTONE 18-0840 so that it calms down the pop of honeysuckle but keeps it cool at the same time. Pinkish brown like Apricot Brandy PANTONE 17-1540 for a tonal variation on the reddish pink theme. This time, I’ve classified my favorites under the style they come under! I am sure you’ll find one that you like – dressy, over-the-top, everyday or plain casual- Honeysuckle is a versatile color that anyone can wear at any time. Tagua (Tah-gwa) Nuts are seeds that are sliced, dyed and polished by families in the South American rainforest. 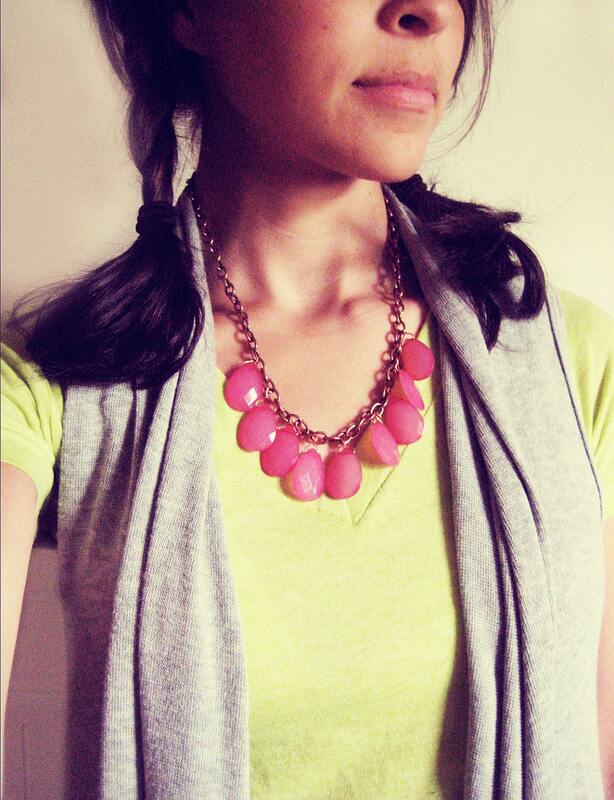 They are lightweight and all the colors used in this statement necklace by decoratethediva are gorgeous! A bracelet that can bring you luck and look good at the same time!! 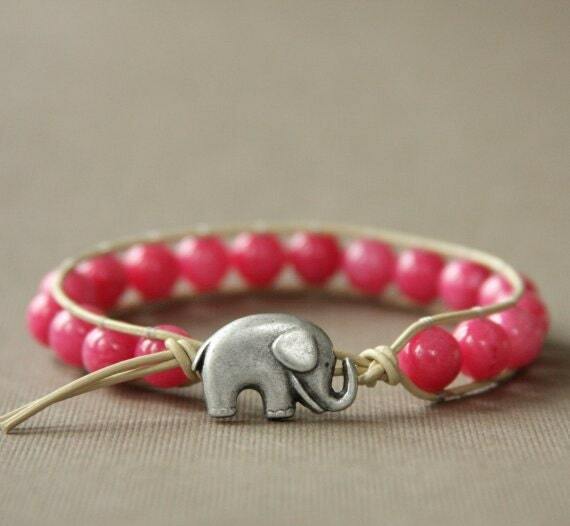 This beautiful summery bracelet uses semi precious Jade beads in honeysuckle and features a cute little silver elephant too! I am partial to elephants and apparently an elephant with its trunk raised up is considered lucky! Who knew! I LOVE LOVE these stunning earrings by Tenthings and I think I’m in love with all their other creations too! 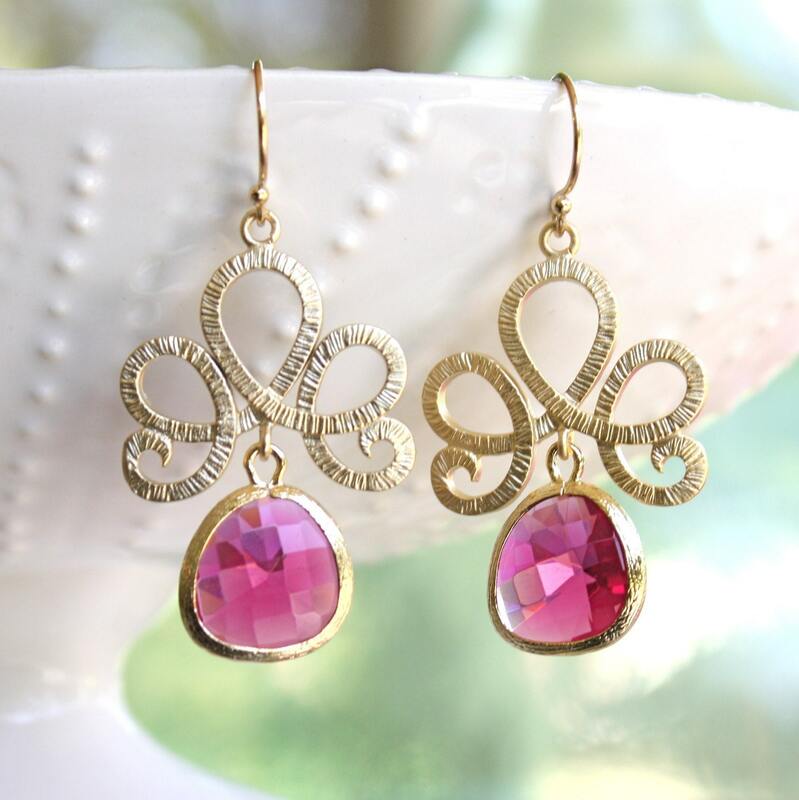 These beauties have dangles in Indian ruby glass surrounded by gold attached to swirly lotus ribbons in gold-perfect for a special occasion or a special day! 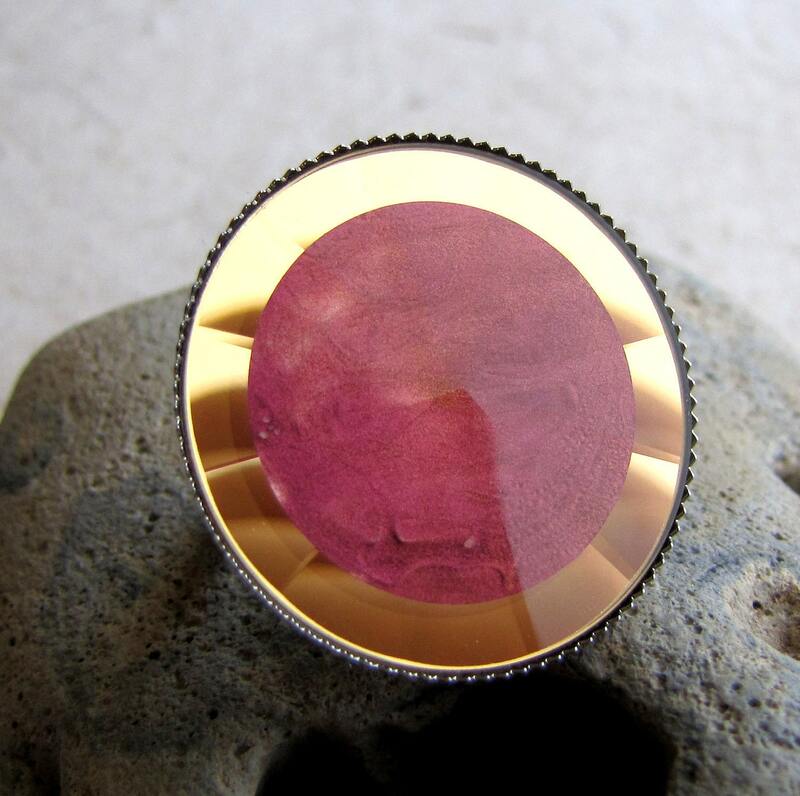 This beeeyoootiful ring has a pyramid faceted glass cabochon that is handpainted in a shimmery swirly pattern. The colors shift from an amber tone to a deep blush pink!! I could wear this every day for the rest of my life!! It’s so beautiful! Do you have a favorite color combination that includes Honeysuckle? ?